Tribologik Oil Analysis Laboratories are ISO 17025:2017 certified, which is the highest ISO standard for testing laboratories. ISO/IEC17025:2017 specifies the general requirements for competency to carry out tests and/or calibrations, including sampling. It covers testing and certifies that they comply with the highest international standards. The ISO/IEC 17025:2017 standard specifically addresses factors relevant to a laboratory's ability to produce precise, accurate test and calibration data, including management requirements and technical requirements. ISO 17025:2017 auditors stand behind each laboratory technician to verify that testing procedures and standards (e.g. : ASTM) are being followed systematically down to the least details. 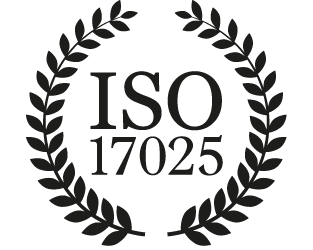 ISO 17025:2017 also assigns specific responsibilities to higher management pertaining to quality control, documentation, traceability, continual improvement, communications with customers. ISO approval is awarded on a test by test basis. Unlike labs where ISO accreditation applies to a number of tests only, our ISO certification covers all the tests performed at Tribologik laboratories, which is a guarantee that all oil analysis services provided by Tribologik® to fixed and mobile equipment operators do comply with the highest international quality standard.